In 1932, Tod Browning had as safe a claim as anyone on the title of “Greatest Horror Director Alive”: following a string of films with silent horror icon Lon Chaney, Browning had directed Dracula, an absolutely massive hit which put Universal Studios on the map and would, quite literally, define the genre for decades to come. To top that film’s success, Browning revisited his earlier career as a carnival barker to create the infamous pre-code shocker Freaks. This, functionally, was the end of his career: the studio disowned it, critics and audiences shunned it (one woman sued MGM on grounds that watching it caused her to miscarry), and if prints weren’t salvaged and taken on tour by actual travelling sideshows, it almost certainly would have been lost to time. Yet the very aspect of Freaks that caused outrage at the time is, without a doubt, the part that holds up the best today: its cast of more than two dozen bonafide sideshow performers. Putting aside the inherent exploitation that can be read into putting these people on camera in a movie called Freaks, Browning’s treatment of their characters is surprisingly sensitive for the day, giving each one their own arcs and desires, and contrasting them against the cruelty and prejudice of the so-called “normal” characters. Dracula remains a cultural touchstone, but it is Freaks that has granted Browning immortality. 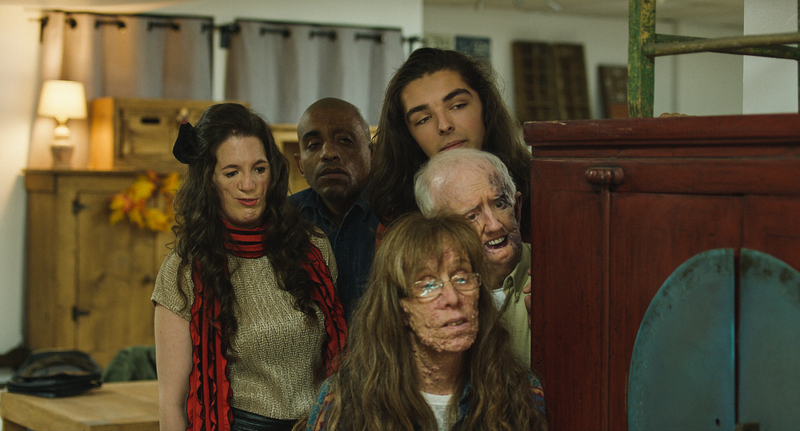 It’s not hard to think of Freaks while watching Happy Face, the new film by Montreal-based director Alexandre Franchi. Unlike Freaks, Happy Face is in no way a horror movie, but like Browning, Franchi puts his money where his mouth is by filling his cast a number of real-life facially different people. As with Freaks, there will likely be those uncomfortable with Franchi’s subject matter and approach, but like Browning, Franchi’s aim is to show the humans underneath the differences– for better and for worse. The central character in Happy Face, however, is decidedly not different. In fact, he’s a long-haired, Cervantes-reading heartthrob who wouldn’t look out of place in the cast of Riverdale. But when his mother is admitted to the hospital with extreme, late-stage cancer, Stanislaw has a breakdown, and rather than confront his situation head-on (or even visit his mother in the hospital), he copes by distorting his model-pretty face with scotch tape and gauze and attending a support group for the facially different. Some of the people he meets are survivors of accidents or disease, while others have been living with their conditions their entire lives, but all are having trouble coming to terms with their places in society. When Stan is “outed” by group leader Vanessa (who does not have a facial difference, but rather empathizes with her clients via her eating disorder), Stan takes charge, pushing his new friends to confront their issues and force society to deal with it. Through it all, however, Stan still has trouble wrestling with his own demons, and soon he realizes that you can’t always “fix” everything, no matter how much charisma you have at your disposal. In some ways, it feels difficult to judge Happy Face purely as a film, given how much of the film seems to be real. For starters, Franchi conceived of the story while in a similar place as Stan, coping with his own mother’s devastating battle with cancer. More to the point, each member of the cast (many of whom had never acted before) brings their own unique experience to the story and to their characters (as Franchi acknowledged in the post-film Q&A, he threw out a good deal of the script after getting to know his actors, adapting their characters to fit their experiences and personalities). The result is a film that feels personal and intimate in a way that few manage to be. You get the sense that, by acting in scripted therapy scenes, many of these people are experiencing the real thing. But all of this makes Happy Face sound much more punishing than it actually is. The heart of the film lies in its cast of characters, and as the film progresses, it’s difficult not to cheer for them. Each character is a fully formed person, to the point where you almost wish you could spend more time with some of them (I was particularly fond of former stunt car daredevil “Dangerous Dave,” who departs abruptly halfway through the film, though his exit line is a true gem). But the ones who stick around give performances equally haunting, likable, and deeply felt. For me, the standouts included brash aspiring model Maggie (who manages to be incredibly expressive despite her largely immobile features) and Otis, an estranged grandfather who has perhaps the best and most joyous scene in the film (“Fuckface wins!”). It should go without saying that Happy Face packs an emotional punch, and that prospective viewers may be challenged by its in-your-face approach (no pun intended). But it also must be stressed that it is much more fun and engaging than its logline might suggest. Happy Face is a bold, extremely personal film which sets a new bar for inclusionary casting. Your move, Hollywood. Part of the 21st annual Boston Underground Film Festival— keep watching this space for the Hassle’s continuing BUFF coverage!